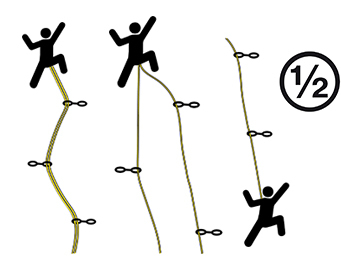 Single ropes are the most common type of climbing ropes and have many uses. They are used for top rope climbing, sport and trad climbing as well as indoor and gym climbing. Single ropes are used in a single strand, therefore the handling is very simple and easy. Standard single ropes range from about 9.5mm to 11mm in diameter. High end single rope are thinner with a diameter around 9mm and smooth covers. Single ropes are tested in a single strand according to the UIAA standard, which references EN 892 with a test mass of 80 kg. They need to withstand a minimum of 5 falls and the maximum impact force must not exceed 12 kN. Half ropes are engineered to be used in pairs. On the one hand, can be clipped together in the belays to create higher safety especially in sharp edged environment (Pic. 1). On the other hand, they can be used with half rope climbing technique. In this technique, half ropes will be clipped alternately into the belays to reduce drag and create higher redundancy (Pic. 2). 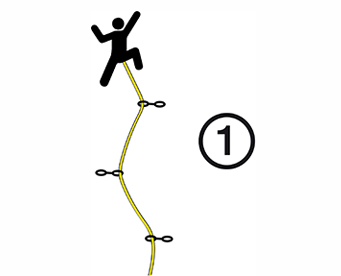 By tying both ends together at the end of the route, the full length of the rope is available for rappelling. An additional advantage of half ropes is their possible use as a single strand in top rope situations (Pic. 3). This can for example be useful in three-people rope teams with two followers. Half ropes range from about 7.9mm to 9mm diameter, are lightweight and most of the time dry-treated. That’s why they are mainly used for ice climbing, alpine climbing or mountaineering. Half ropes are tested in a single strand according to the UIAA standard standard, which references EN 892 with a test mass of 55 kg. They need to withstand a minimum of 5 falls and the maximum impact force must not exceed 8 kN. The lower mass is used because it is assumed that half ropes normally share the load between both strands. Twin are also engineered to be used in pairs but only in a double strand configuration where both strands are clipped together in the belays. The two strands then work like a single rope but offer additional redundancy and higher resistance at sharp edges. For this reason, twin ropes are mainly used in alpine climbing, mixed climbing and ice climbing. Twin ropes range from 6.9mm to 9mm diameters. 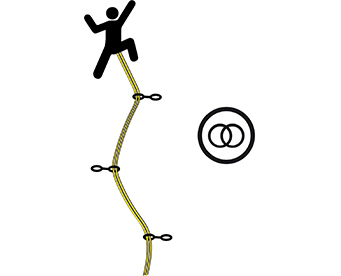 Twin ropes are often even lighter and thinner than half ropes. Twin ropes are tested in a double strand according to standard EN 892 with a test mass of 80 kg. They need to withstand a minimum of 12 falls and the maximum impact force must not exceed 12 kN.